The Dell SonicWALL 4-Port GbE Module1 expands port density of a Dell SonicWALL NSA Series firewall by adding four 1-Gbps Ethernet networking interfaces that negotiate the best Ethernet speeds available. 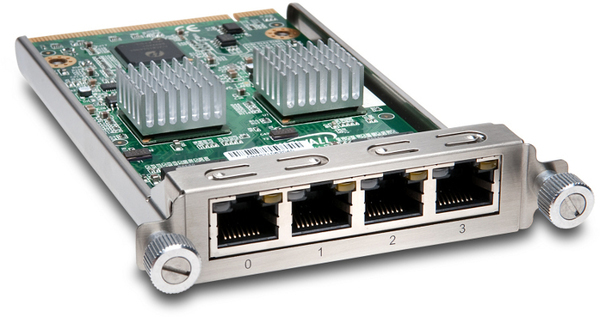 The 4-Port GbE Module negotiates 10/100/1000 Mbps (1 Gbps) Ethernet speeds. It can automatically negotiate the best speed available through MDIX. It can also be manually configured to a particular speed. The 4-Port GbE Module adds connectivity without incurring costs of an additional switch, reducing potential points of failure associated with separate multiple-vendor solutions. Administrators can centrally manage multiple firewalls and their modules using the Dell SonicWALL Global Management System.